We welcome all artists. Beginners or Experienced. A great way to gain experience showing your art. Which black oil color should I paint with? Black is the product of fire. Color in the absence of light. Black is also the color of mystery, mourning, and Johnny Cash. Why use black in a painting? Simply put, no other color quickly or effectively creates shades as black. However, the strong mixing strength and/or temperature of some blacks can be difficult to control in nuanced color-mixing. Just as we have different whites in our Artists Grade line of oil colors, we offer six different blacks, each with their own unique characteristics. 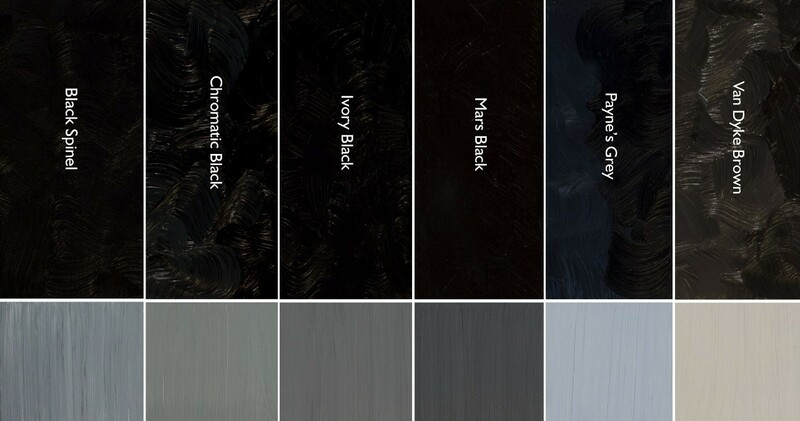 The relative opacity or transparency, tinting strength, and color temperature of a black all influence how it will behave on our palettes and in our paintings. For this run-down of our different blacks, we’re including both Van Dyke Brown and Payne’s Gray as their temperature biases factor importantly into the discussion.